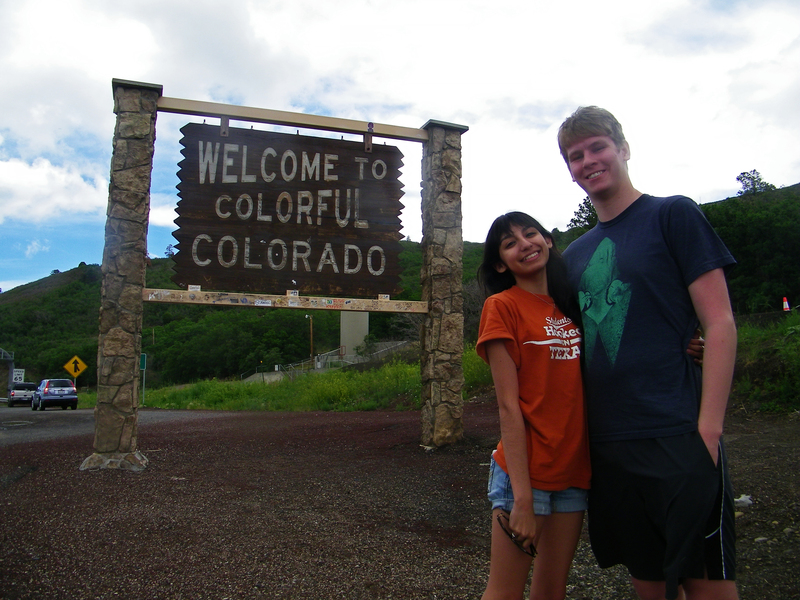 On our fifth day on the road, we left wonderful Colorado and headed south west to Arizona. 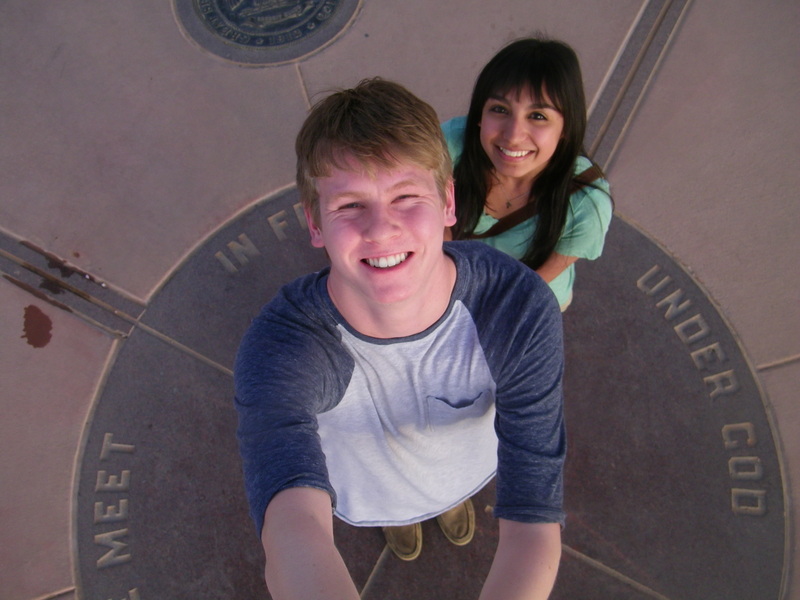 Our destination was Flagstaff, but first, we wanted to stop by the Four Corner National monument. Our route took us through Utah, which felt more safe (and probably faster) than driving back south through all of the mountains in Colorado. It didn’t take us very long to make it to Utah, and I was disappointed to see that the landscape looked pretty much the same as everything else we’ve been experiencing on the road. 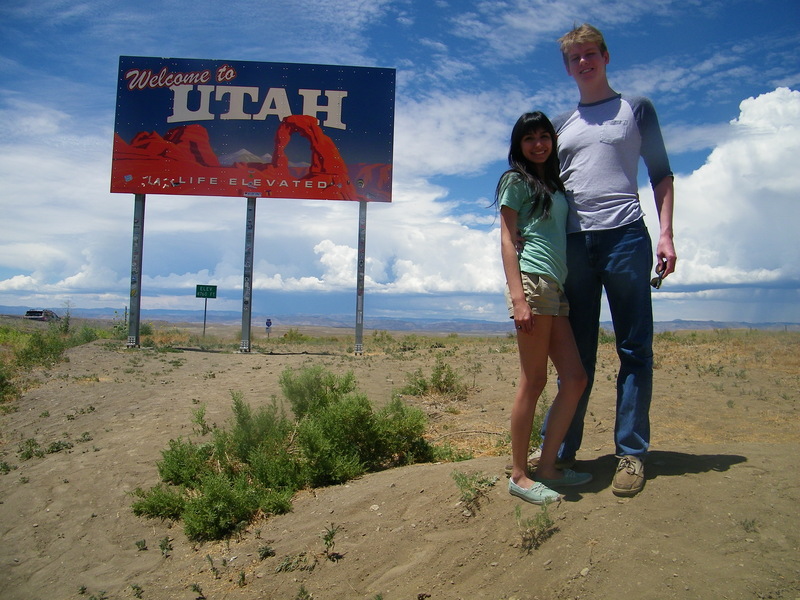 I wanted to see those awesome giant red rocks you think of when you imagine Utah. Thankfully, after an hour or so, we started seeing the glorious rocks I imagined. 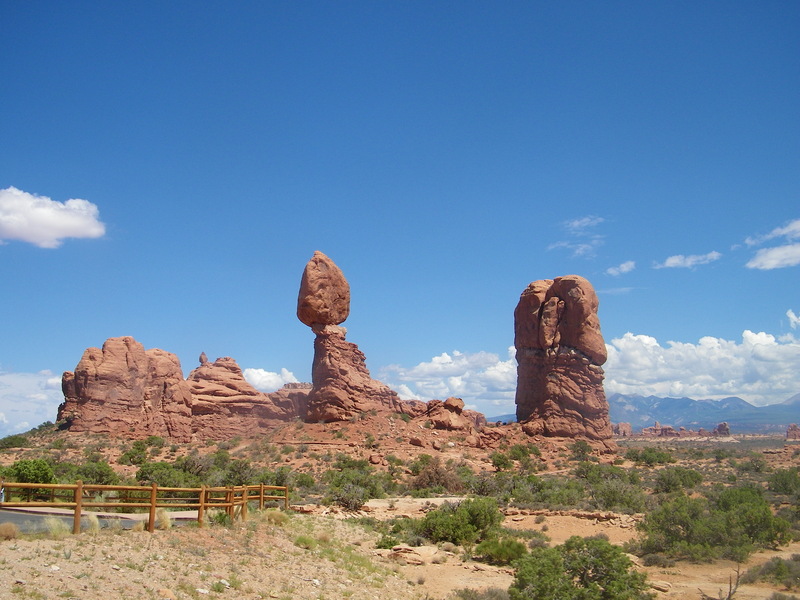 While driving, we kept passing by signs that pointed towards the Arches National Park. I wasn’t really sure what that was, but I didn’t want to miss another national park. (We’ve passed by a few on our whole trip.) I had a feeling the rocks were going to be pretty amazing in it. So we made a spontaneous trip through the park. We were pretty pressed for time, so we drove through about an hour. 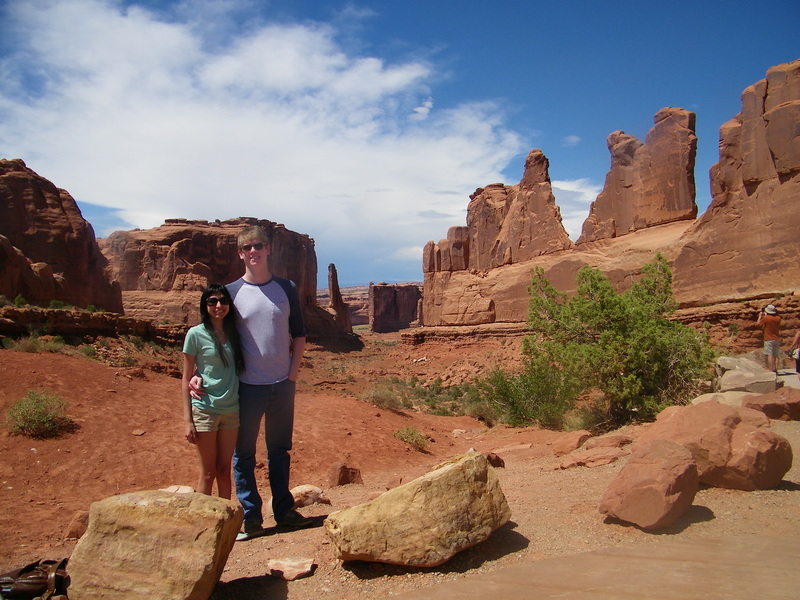 We didn’t get to the see the famous Utah arches, but we still saw some pretty cool sights. I was satisfied with the stop! 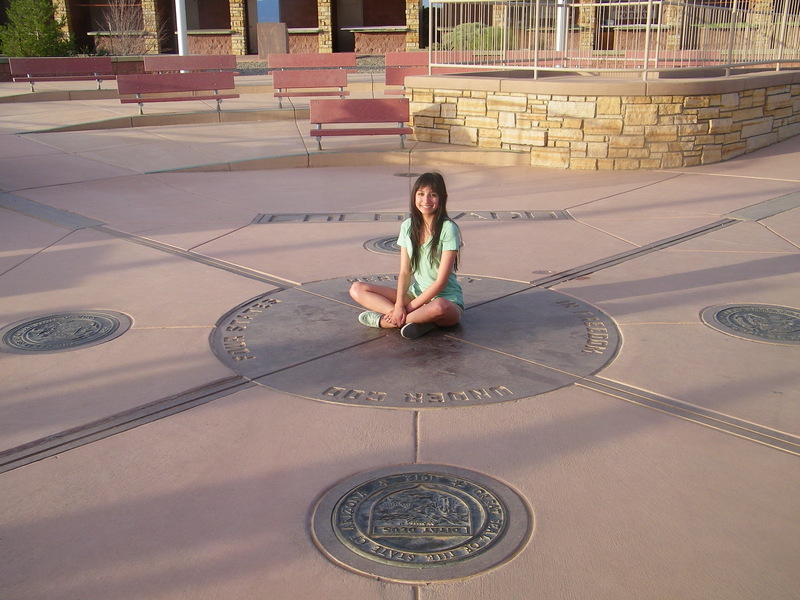 Now an hour behind schedule, we got back on the road and headed to the Four Corners. It was still a few hours away, and we were already getting tired of being in the car. We made a quick food stop, and kept on the road for a very long time. 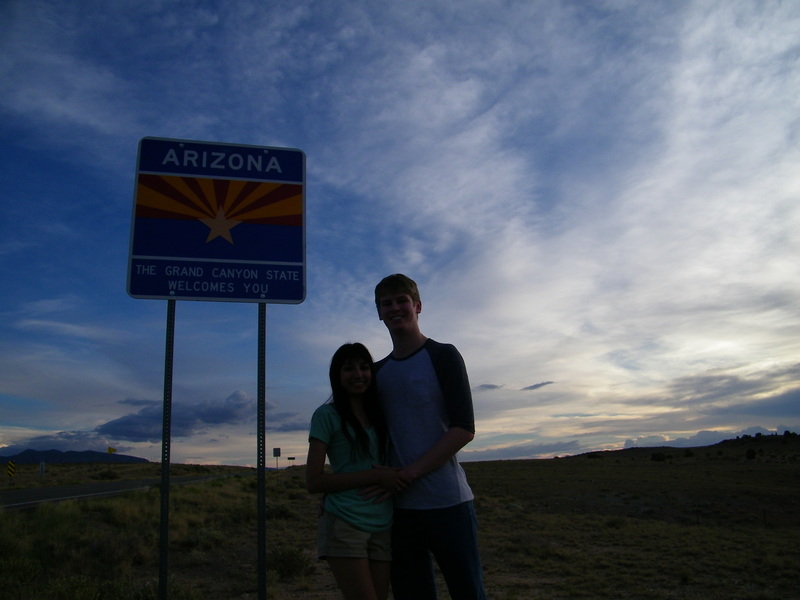 8 pm came pretty fast, and we were forced to get back on the road to Flagstaff. Unfortunately, the sun was almost gone, and we still had more than a few hours until we were at our hotel… The drive was unbearable. We were on a two way highway for basically the whole drive, with many people nearly blinding us with their brights, it was windy, and it even started drizzling at one point. Finally, after what felt like the longest drive of our lives, we made it to our hotel and quickly went to bed. So we drove all the way back and finally found the place, arriving right on time. 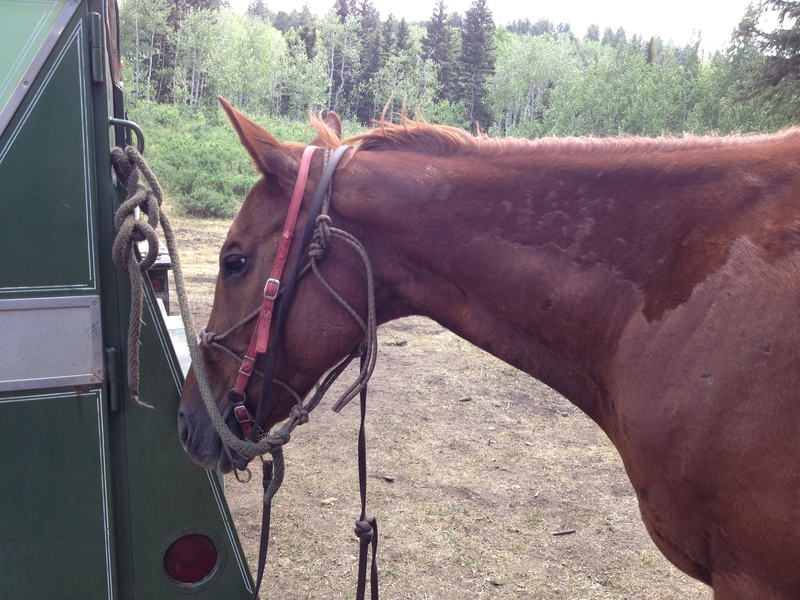 After we got there, there was a little confusion with the payment, but thankfully it was all sorted out and we mounted up on two horses named Skunk (because of her tail and fortunately not her smell,) and Captain (the slowest horse of the bunch.) The people that took us on our tour were very nice, and pretty surprised to hear that a pair of Texans have only been on a horse a few times in their lives. The tour we chose was an hour long and it was through some nice hilly, wooded areas. There were a few clearings with beautiful sights, but it was a little difficult to take photos, as my horse kept trying to steal little snacks the whole way, nearly yanking the reins out of my hands. On our way back, we saw some bear markings on a few trees, and I am thankful we heard about on the way back to the safety of our car instead of on our way into the woods! 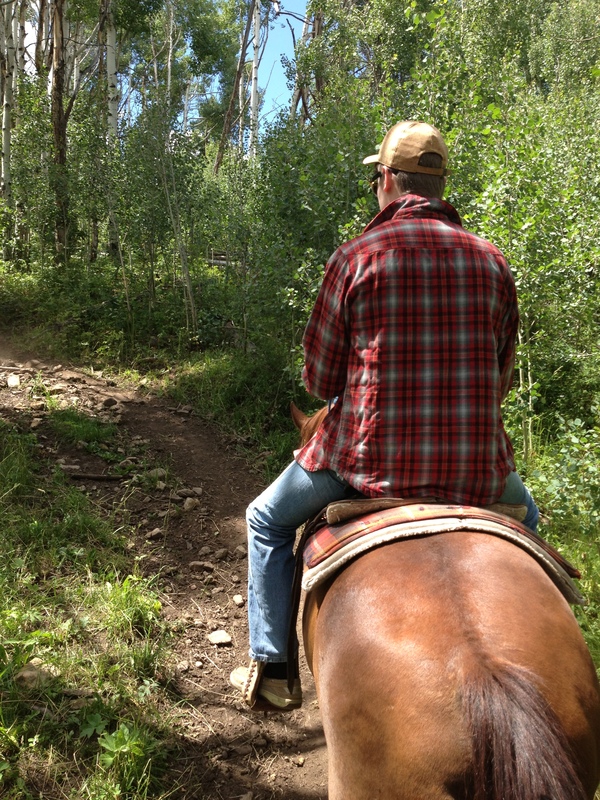 When we made it back to one of the first clearings, our guide was nice enough to take a photo of us on our ride. When we finished, we decided it was time to grab some more delicious ice cream at Paradise and headed back down to town. We stayed there for a little while, enjoying our last day in Aspen, exploring the shops and buying our souvenir fridge magnet. When we were ready, we left to our hotel in Snowmass where we later had a candy craving and decided to take the gondolas down to the valley in search of some more sweets. It was a nice spontaneous activity that brought us outside into the wonderful weather, where we enjoyed it for our last night in Colorado. On day three of our trip, we covered a lot of ground. We slept in a little bit (being on the road wears you out!) but we were off to Aspen Mountain before the afternoon. We were able to ride the gondolas all the way to the top. 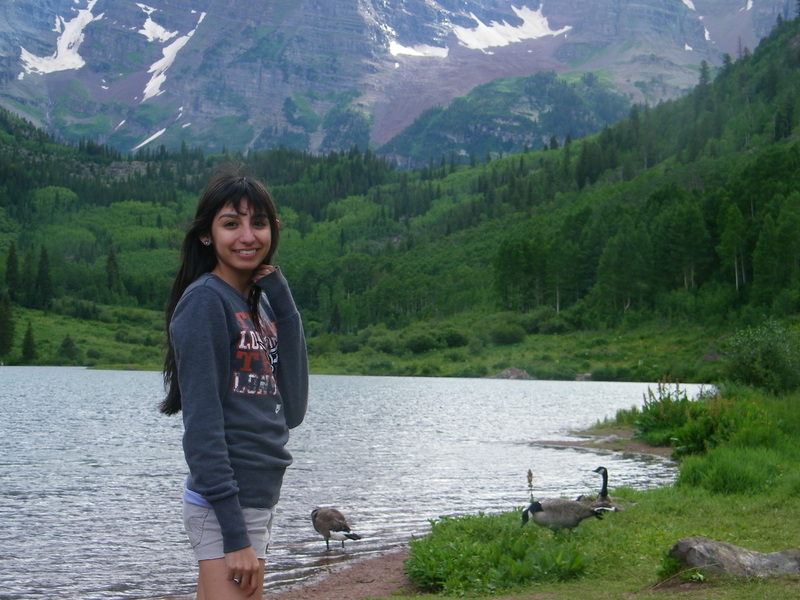 The scenery and atmosphere was so wonderful, I never wanted to leave. 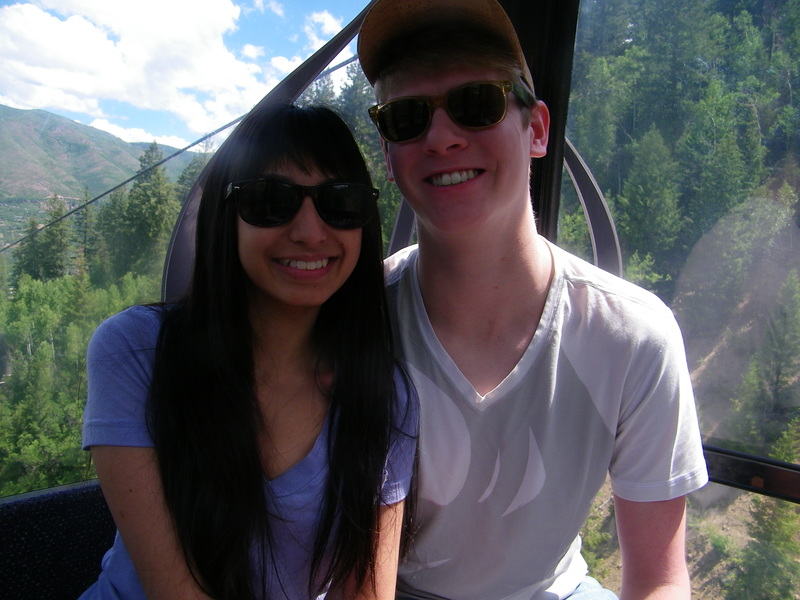 The ride on the gondola was a nice slow ride, and gave the best view of Aspen right behind us. 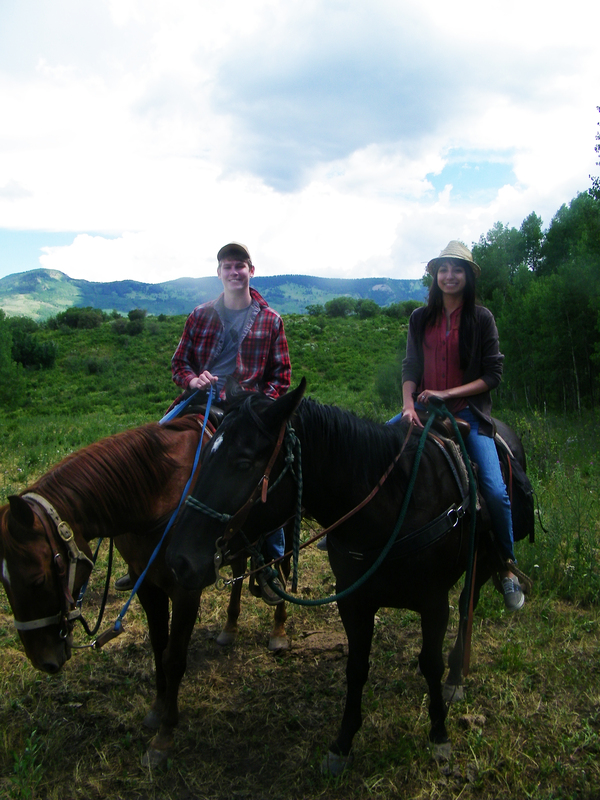 When we stepped off of our ride, we were at an elevation of 11,000 feet. The air was so fresh, and the smell was amazing. 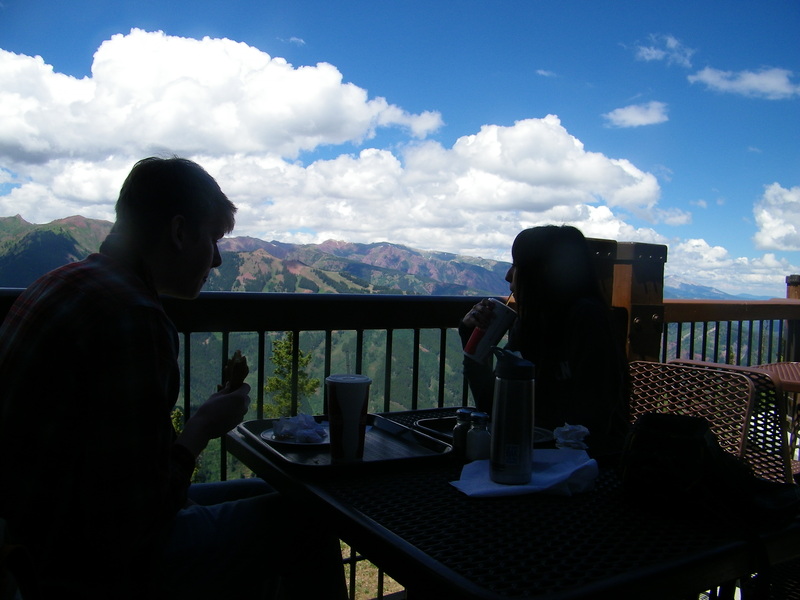 We headed straight for the mountain top restaurant, as planned, and ate the cheesiest and most delicious pizza I’ve ever tasted. I love New York style pizza, and it was the best treat to enjoy as we looked across the stunning view of the surrounding mountains and valleys. After we had our fill, we enjoyed a few games of checkers while we waited for the next nature tour to begin. After a lovely few hours atop the mountain, we headed down in search of a delicious snack. We were suggested an ice cream place called Paradise. After walking up and down on the same road for about 10 minutes, we actually found one of the hardest license plates. Alaska. I was a little too excited to cross it off our list of plates, and snapped a picture for my app. Finally, after more confusion from the Apple Navigation, we found the place a few steps further than the pin point on the map. It was nestled in between a few shops, a tiny bakery, and it was packed full of people. We ordered a few scoops of ice cream and a sugar cookie. I have to tell you, if you ever visit Aspen, Colorado, you need to stop by Paradise. It was the best ice cream I have ever had in my life. I had a scoop of mango gelato while Riley had the usual vanilla, and they were just so perfectly soft, yet not melting, and not too cold. The flavor was so delicious, we ate them both right away. 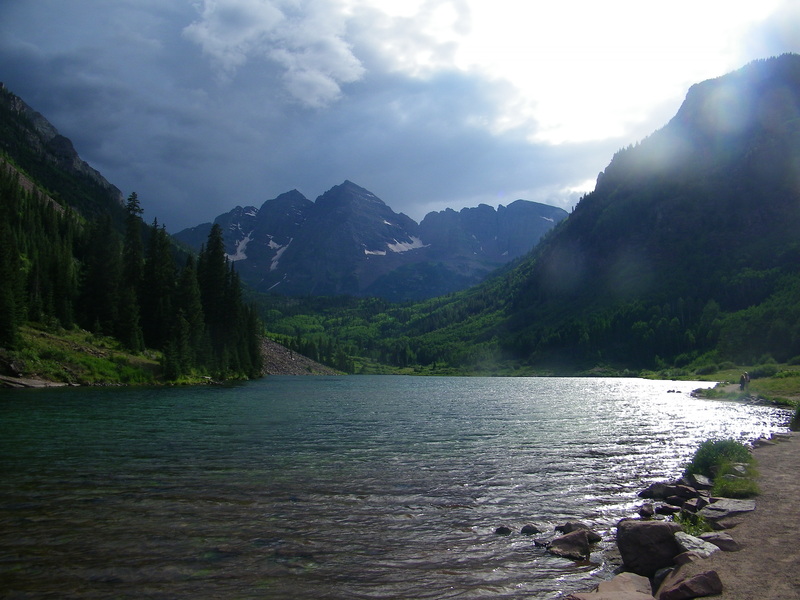 When we finished our mouth watering treats, we decided to head to the Maroon Bells for sunset. We arrived at the shuttle station, thinking we could only take a bus, and we were told we could just drive ourselves, but the gates closed at 6:00 pm, in just 5 short minutes. So we skipped the fees and ran back to our car to try to make it before they closed. It was just a few miles away, but it took us about 20 minutes to actually arrive! Colorado is full of winding roads that you forget how long it takes you to get to places because you have to drive so slow. When we finally reached the gates, we were surprised to find out that it was still open, and I don’t even think it closes until nightfall because there are campsites there. Regardless, we arrived with plenty of sunlight to spare. 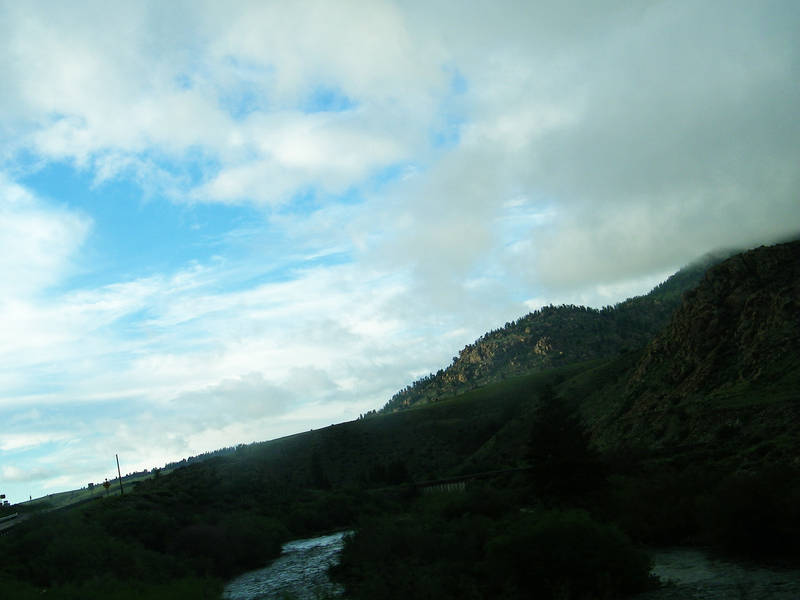 It was pretty cloudy and sprinkling a bit when we got there, but one thing we learned on our nature tour was that the weather in Colorado changes so quickly, we weren’t really worried. And we were right not to be because, in less than ten minutes, the weather cleared up above us, and gave us some nice light to explore by. The view at the bells is so beautiful and breathtaking, it almost looks as if you’re staring at a painting, Most of the views near Aspen look that way it seems. We took some nice shots while enjoying our surroundings, and we even walked on a few trails around the area. We even found a few geese just relaxing by the water with their little goslings. It was such a peaceful sight, I didn’t want to leave. As the sun started setting. we made our way back to the hotel in Snowmass where we walked to the mall and enjoyed a few hamburgers, then relaxed in the hot tub for a while. The day was very fulfilling and I was so happy to be back in Aspen. We talked about our plans for the next day, and finally got some shut eye. The drive was way more enjoyable, seeing that we were experiencing the northern terrain’s (north of Texas that is) mountainous land. 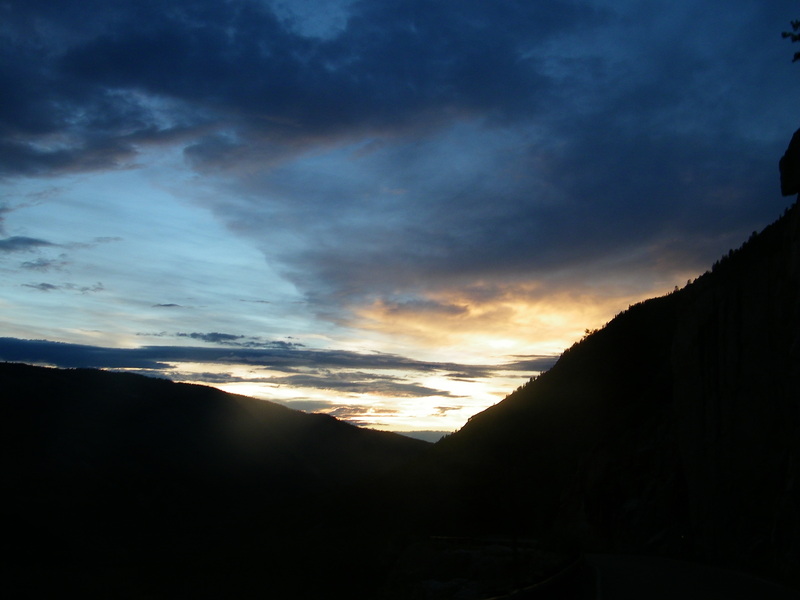 The trip was longer than the first, and it took about 10 hours total to arrive at our hotel in Snowmass, just about 20 minutes north of Aspen, but again, the trip was way more enjoyable because of the scenery. 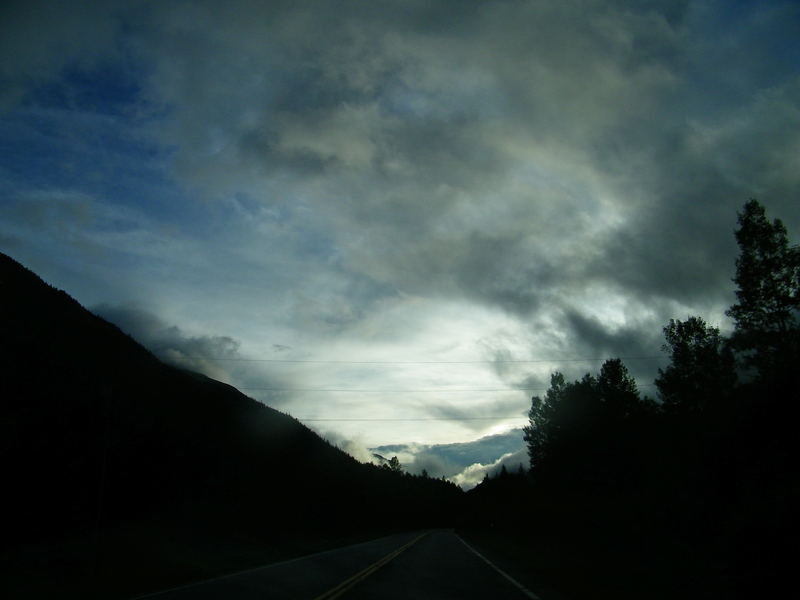 Our journey through the mountains was a little nerve racking because it was really cloudy, plus the sun was already setting. 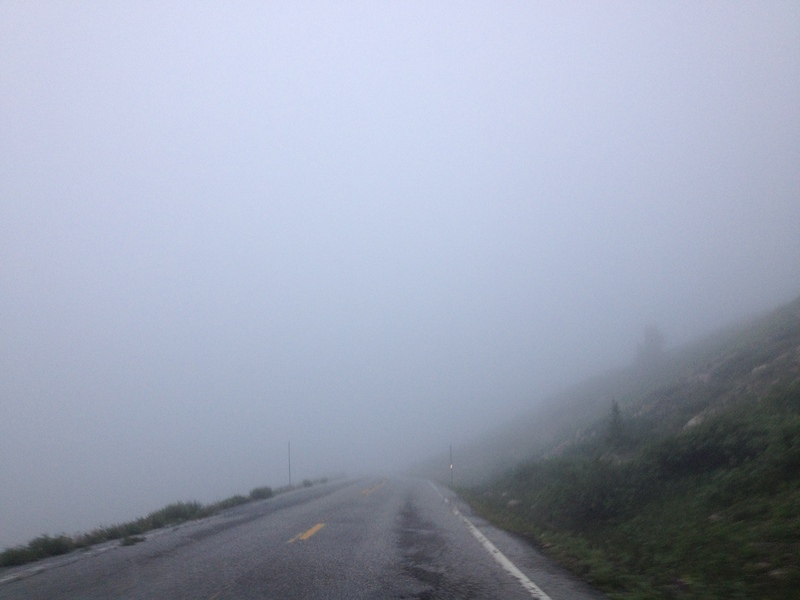 And we actually drove through a cloud at 15 mph for around 10 minutes on a mountain road at 12,000 feet elevation! 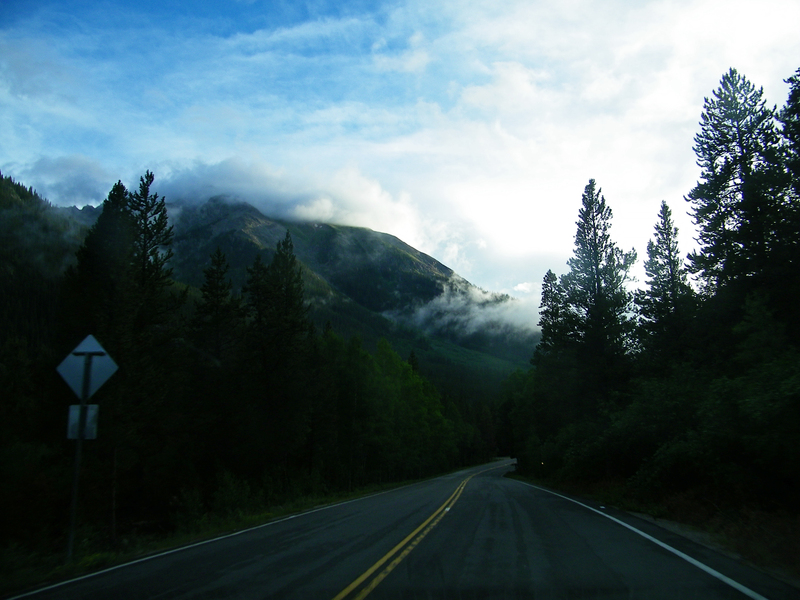 The whole drive up the mountain was really serene, peaceful, and of course beautiful. We had Grizzly Bear’s song, Colorado, playing right as we crossed the state border and the soundtrack to our mountain drive was Sigur Rós. An Icelandic band with relaxing ethereal melodies, it was perfect. So, writing down my trip experiences has shown to be more difficult than I thought. I have been so exhausted every day and just want to relax instead of sitting in front of the computer. I have some down time at the moment so I thought I would write about what I’ve done so far. I will put each day in different posts to save from having one large post. 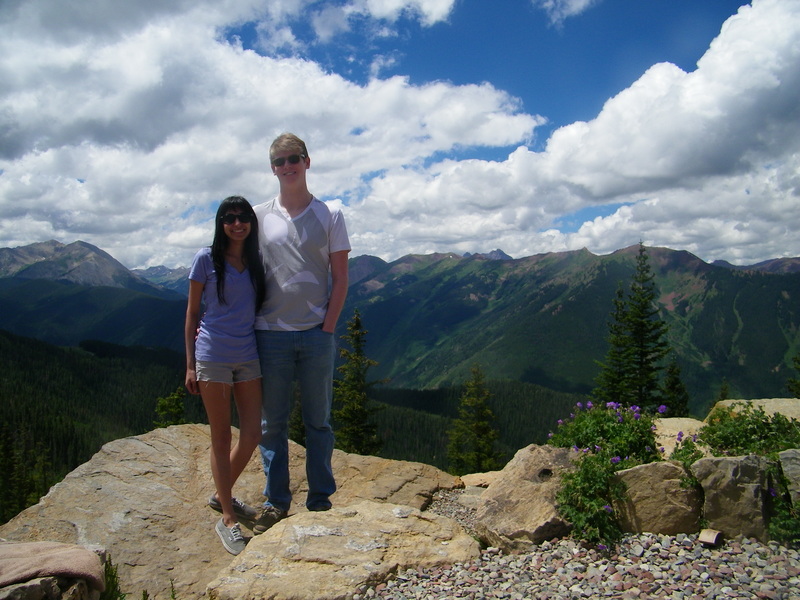 On our first day, we embarked on our first destination towards Aspen, Colorado. We (my boyfriend Riley and I) didn’t want to spend an entire day and night driving across the state, so we stayed in Amarillo, Texas as a half-way point, just to be safe. The trip from Austin was flat, very long, and there was a whole lot of nothing, but we made do. Our main source of entertainment was an app that I downloaded, the license plate game. It is way more fun than it sounds, especially on a long road trip. We were constantly trying to focus and catch up to cars that seemed like they from out of state. I know we missed a few, I swear I saw Illinois, but we still ended up with thirteen the first day, which I think is pretty good! We found Texas, obviously, Oklahoma, Louisiana, Florida, Kansas, Tennessee, Missouri, Arizona, Arkansas, Nebraska, California, New Mexico, and Colorado. Throughout the long day, we snapped some nice shots of the great plains. 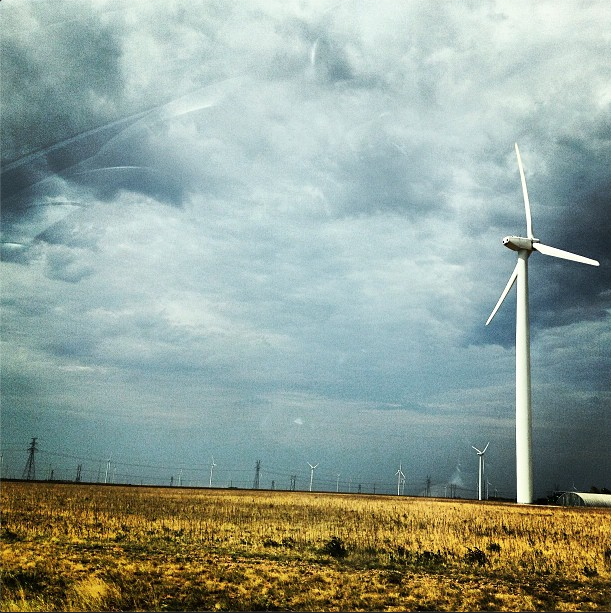 We even drove through the wind capital of the United States, Sweetwater, Texas. There were huge wind turbines for miles which really was pretty cool. Just when you think you’ve seen all of the turbines, many more miles of them pop up in the distance. We also found happiness during our drive through Happy, Texas. Although there wasn’t really anything there, it was still a cool place to pass through. Our day finally came to an end after about 8 hours. The weather was way cooler than I expected when I stepped out of the car, forgetting that we were now in the north. We stayed at the Ashmore Inn and Suites, which was lovely. I would definitely recommend it if you need somewhere to stay in Amarillo. I especially loved the king size bed and cozied up right away. I was very excited to head to Colorado in the morning. I’m going to go ahead and say it’s my favorite vacation spot. There’s nowhere better to be than Aspen, Colorado. Needless to say, it was difficult to fall asleep and I was so tired in the morning, but I was ready for a more exciting adventure. For my 20th birthday, my boyfriend gave me the gift of traveling. And 2 months later, we’ve finally planned our trip and are ready to leave in just 4 short days! I’ve never been on the road so long, or traveled so far by car. I have to say, I’m more than nervous, but I’m very excited as well! I can’t wait to experience these new places, I just wish I had an awesome DSLR camera to properly document. For now, I’m stuck with an IPhone and an outdated point-and-shoot cannon. But, I promise to try and update the blog as I go so my family, friends, and followers can see my great adventure to the west coast. The moment I have been waiting for is here. My Etsy shop has had a lot of new changes, and it is now, ModernElm. I feel that the name is more fitting. It represents the kind of items I’m selling, the items are for your style and represent you, hence the new abbreviation. I’m also beginning to incorporate more natural elements into my creations, and the name stuck. The changes are also just in time for the 1 year anniversary of my shop opening, which is tomorrow July 9. And to celebrate, I am offering a one day sale of 20% off all items in the shop! So tomorrow, please visit one of our social media sites for details on the sale! Let me start off by saying that this is not a rant about how much I dislike universities and that they’re a waste of money. Universities are a great place to learn, and I have learned so much at the University of Texas at Austin while having some great experiences. But, if you are unsure at all of what you want to major in or do in life, please have a read of what I am going to say. I will try to make it as short and interesting as possible, or you can skip to the bottom for the main message, I suppose. But, as the semesters rolled on, my interest in biology kind of vanished. The more advanced classes I was taking in biology and chemistry, the more I realized that this field of work was not for me. I did though, like psychology and thought about doing research or personality psychology research in animals after I graduated, so I decided to try to transfer to the school of psychology at my university. In my sophomore year was when I applied for an internal transfer. So instead of taking major specific classes, I was taking classes that were required for everyone to graduate. And that year was when I learned that the longer you have been at the university, the less likely you were to be accepted as a transfer student to another college within the university. Freshmen are the most likely to be accepted for an internal transfer, because one of the main things the school considers if whether or not you will graduate in four years. The longer you wait, the harder it becomes. I unfortunately was not accepted, so my search continued. I was still in the College of Natural Sciences, but changed my major to undeclared. As the semesters went on, the more I was just trying to find a major that I found interesting to get a degree in, not necessarily something I wanted to use towards a job. I experimented with classes in different subjects like geology and even thought about applying to that school, but realized it was too close to the biology degree for me to enjoy it, plus I wasn’t wanting a job in that area. With basically all of my core requirements completed, I had no reason to attend summer school. I was still on the track to figuring out what I wanted to do. Then finally, I realized, I’ve always loved messing with graphics and creating my own art, a degree in graphic design sounds perfect for me. I talked to an adviser in the art department, but was disappointed to find out that the design school was so small one to no students at all were accepted as internal transfers per year, and I could only apply the fall of my senior year. My only backup option was a degree in studio art, and my admittance was not very promising. Realizing all of that, I looked toward the community college here which offers an associates and certificate program in graphic design. A lot of the classes I’ve taken go towards those graduation requirements, so it’s as if I’ve taken my basics at the university and will transfer them to community college. The complete opposite of what should have happened. If you are at all unsure of what you want to major in, or think you know, but are not 100% sure, starting off at a community college is probably best for you. At a community college, you can take your basic requirements, experiment with some classes and find what you’re interested in. Plus, it is considerably cheaper. Then, you can transfer those credits (if applicable) to a university and they can count towards your bachelors degree. I wish that I would have done this, I feel like I would have realized what I wanted to do sooner and not feel as panicked trying to decide a major and wasting time with transfers that were unsuccessful because I would probably take a semester or two more than the targeted four years to graduate. Because of this, I will not earn a degree from my first pick university that I’ve been attending for almost three years. I hope this was helpful to you if you’re trying to make a decision. I was completely against attending a community college my first year after high school, and I know now how naive I was being because I’m sure it would have helped. Destiny Awaits, I Have Found My Calling.. Finally, after years of consideration, and through the ups and downs of uncertainty, I have finally figured out what I want to do with my life. For some, it comes so easily, and is a no-brainer of what they want to do for the rest of their life, but for me, it was much more difficult. I thought I knew what I wanted to do, more times than I can count, and now I know for sure. Hopefully everything turns out great and my developing skills will be recognized after my first semester as a design student! In order to live a happier life, live in the now and let past things go. Don’t let handicaps hold you back. Don’t be too scared of the world around you, be curious. When you’ve found someone you love, never let them go.